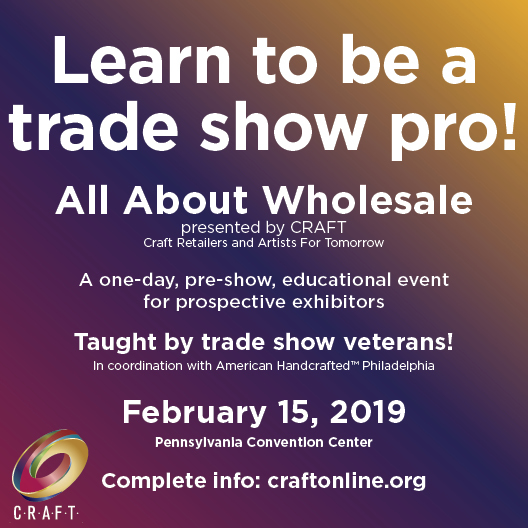 CRAFT, a non-profit trade association dedicated to supporting people in the craft business is presenting a dynamite seminar, ALL ABOUT WHOLESALE on Friday, February 15 at the Pennsylvania Convention Center in conjunction with the American Handcrafted Philadelphia trade show. The course is a complete overview of wholesaling and perfect for artists who are thinking about selling wholesale, planning to exhibit at a trade show, or in need of refreshing their skills. Bring a sample and we will appraise your products! We will evaluate your marketing materials, too. You get the complete presentation to keep. The class is flexible with time for questions and discussion. How to look great and attract customers! They are offering a $50 discount to local artists with the promotional code CWE.